This Creative Crew Challenge was to use a stamp set from pages 111-119 in the Annual Catalog and make something in a new way for me! I used the Happy Day stamp set and the Double Z Fold on this card. We were also to keep two colors from the Eastern Elegance challenge (you will see that card tomorrow!) and I used Coastal Cabana and Smoky Slate. Here is what the card looks like when it's open. There is plenty of room to write your sentiments down and I repeated the border that I have on the outside panels in a vertical way on the top part of the panel inside. Here is a close up of the main element on the front. I stamped the lacy element from Happy Day lightly onto Whisper White card stock. I cut it out using the Circles Collection Framelits and then added a Smoky Slate border that is from the Perfect Pennants Die. Over the lacy element I stamped "sweet" after coloring just that part with my Coastal Cabana Stampin' Write Marker. A pearl finishes my elegant circle. The Whisper White Organza ribbon holds my card closed when tied in a bow. Will you please leave your comments below? I love reading them! For all of your own Stampin' Up! 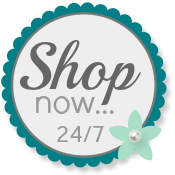 Products, you may use my Online Store. Oh how pretty Patti! I love the edging; so dainty looking. It looks awesome on the inside of the card too! The colors are fabulous. Love the layered sentiment. I have yet to make a card using this fold. Thanks so much for sharing! Thanks for sharing this neat card Patti. I love the colors, too. I have yet to make this fold. You inspire me. Lynn and Rosalie--you make it worth posting my creations! Thanks, Ladies--have a great day! Wow!! love the fold you did with the colors and details of the sides front and inside. Very pretty!! I LOVE this one! So pretty!! and the fold is different than a regular card. Very nice! Great job!